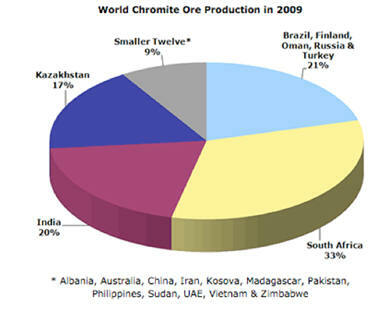 Chrome mining in South Africa facilitates half the world’s production of chrome ore. South Africa has produced over 50% of chrome globally in recent years. South Africa is the dominant global supplier of chrome ore and ferrochrome, which are irreplaceable components of China-dominated stainless steel production. In 2017, South Africa delivered half of the world’s production of chrome ore, and has the capacity to produce 4.2 million tonnes of ferrochrome a year. In 2016, South Africa produced 15.1 million tonnes, which equated to 54% of global production, according to Mining Weekly. South Africa and Zimbabwe hold about 90% of the world's chromite reserves and resources. Early mining of chromite was on a small-scale and was relatively straightforward from outcrops or to shallow depths followed by hand sorting. However, with the increased demand, conventional open-pit mining and mechanical underground mining became necessary. There was sufficient high-grade metallurgical ore to meet demand but with the rapid growth of the stainless and other alloy steel industries, the much larger reserves of the lower grade, higher iron, ores have had to be exploited. Glencore-Merafe Chrome Venture, Samancor Chrome, and Hernic Ferrochrome are some of the South African chromite and ferrochrome producing companies. However, the industry has seen a growth in the number of integrated operations, where traditional ore mining companies have integrated into smelting. South Africa has a mature chrome value chain, the socio-economic impact of which includes approximately 200,000 jobs and approximately R42 billion in GDP per annum. However, the South African ferrochrome industry is under pressure. China is South Africa’s largest trading partner, however, China’s capacity to smelt ferrochrome is expected to rise about that of South Africa’s. The pricing of and demand for ferrochrome are influenced by global economic conditions, exchange rates, the demand for stainless steel and chromite supply. Although local ferrochrome companies are among the lowest-cost producers in the world, the slump in commodity prices since 2013 has meant that only four of the seven South African ferrochrome producers are currently operational. Sales of ferrochrome to China, the world’s largest importer of South African ferrochrome, are being negatively affected by increased exports of South African chromite, which is enabling the growth of the Chinese ferrochrome industry. Africa is one of the most mineral-rich continents in the world. Resources in Africa are still largely untapped and despite the hundreds of mining projects in Africa, there is massive room for growth. The future of mining is in Africa – but not without research and guidance. Discover why top mining companies in South Africa rely on Africa Mining IQ to target South Africa's chrome mining projects! Contact us today for subscription plans and pricing. When looking to target business opportunities with South Africa's chrome producers, global investors and more than 170 companies are turning to Africa Mining IQ for its up-to-date mining intelligence, insight into Africa's chrome mining projects and key contact details. Detailed project updates that follow the progression of all chrome mining projects, or any other mining project listed, from grassroots right through to operational!